10. The Road: It was bleak and heart-wrenching and so difficult to watch…but it was unflinchingly truthful and often had a kind of tarnished beauty. An amazing film that I never want to see again. 9. (500) Days of Summer: I think I was dead center in the sights of this film’s demographic appeal. Indie soundtrack (& Smiths shout out to boot! ), check. Ernestly romantic guy, check. Lack of ambition as virtue, check. Creative, non-linear, brain-teasing narrative structure, check. By all accounts, a non-conformist, iconoclastic, incredulous contrarian such as myself should have seen right through this. But I ate it up. 8. District 9: The Office with aliens. Original and touching beyond all expectation. 6. Adventureland: This film tapped into something pretty nostalgic for me, but it also is an amazingly honest portrait of summertime post-teenage angst in low-pay limbo. Performances from main & minor actors hit me in the melancholy bone…and the songs made me shudder with recollection of an adolescence lived to that soundtrack (ROCK ME, AMADEUS!). 4. Up: I did not want to like this in order to resist the Pixarification of my soul, but alas my brain is fully washed and my heart is clay in the hands of these masters. I saw it once with my wife & once with my kids. So great & unforeseeably ingenious. 3. Inglourious Basterds: I really did love this movie, though my reservations of whether I SHOULD have loved it still haunt me. The furthest thing from the cluster cuss this could have been. Note: It’s fascinating to me to see THREE (ostensibly) children’s films at the top of this list. Regression? Longing for a care free world? Return to innocence? My only response is to ask what the cross is between an elephant and a rhino. Honorable mentions: I Love You Man, Watchmen (the credit sequence alone was among the best looking cinema this year), Star Trek. ADDITION: Zombieland ! Wish I could have seen: The Hurt Locker, Bright Star, Moon, A Serious Man, In the Loop, It Might Get Loud, The Informant!, The White Ribbon, The Imaginarium of Doctor Parnassus, Thirst. Not as bad as everyone said it was: The Box (from Richard Kelly, writer/director of Donnie Darko): which had some genuinely creepy, intriguing and touching moments, solid performances, lovely sense of time/place, before it crapped out. And a score from (pretty much) The Arcade Fire! 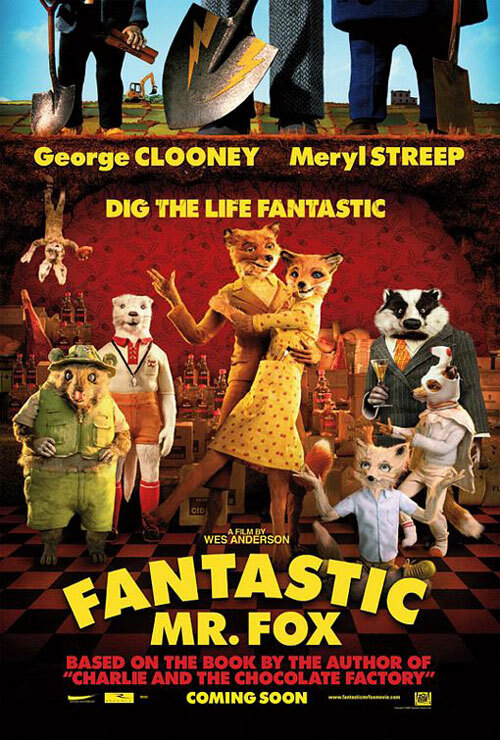 You know, even with the critics raving about The Fantastic Mr. Fox, I wasn’t even remotely interested in shelling out my money for it, but now that you’ve made it your #1, I may have to reconsider. That, and I had the same attitude about Up, and found myself weeping after the opening montage and delighted by the rest of it (“Squirrel!” has become a catchphrase between myself & some coworkers in relation to our principal’s total ADD in staff meetings). As for the movies you haven’t seen and wish you had, The Hurt Locker and Bright Star are definitely worth viewing (both immerse you in their worlds in gritty/excruciating and lush/gorgeous detail, respectively), but The Informant! was a big disappointment for me–it couldn’t seem to make up its mind about what kind of film it wanted to be (or what tone it wanted to have), but felt very smug and self-satisfied, which I found irritating. One final recommendation for your Netflix queue that is actually a 2008 film that I saw in 2009 is I’ve Loved You So Long–a quiet, layered gem of a film. Greg, thanks for this list. I have not seen most of these, and had not even heard of some of them. Specifically, I will make a point to see Fantastic Mr. Fox immediately, in part because it’s your number one and in part because I can watch it with the fam. Also, I’ve been dying to see Adventureland but haven’t been able to convince the wife thus far. Your list emboldens me in this regard. I’m surprised to see “Wild Things” so high- I read a review that trashed it, and I just figured it would suffer from being too stylistic and lacking compelling content. Now I think I might have to give it a go. You are my only link to the world of cool these days Greg so keep these lists coming.